Homeowners make improvements in their homes once in awhile. This is done to improve the resale value of their homes if they want to put their homes up for sale. Contractors may also be hired if there are certain damages on their homes which may cause accidents. Here are a few tips on when you should hire services of a local contractor in your area. Leaking roofs should be repaired immediately. Leaking roofs can cause health problems to you and your family members due to mildew and mold. Rainwater may reside causing mildew and mold to grow posing health concerns in the long run. Respiratory issues may affect you and your family, which may be costly to treat. Home structures may be weakened making your home unstable. Avoid mold growth on your roof by checking the underside of your roofing regularly. If you spot water stains, this is an indication of a leaking roof, and you should contact your local roofing company immediately. Check your gutters and downspouts for small piles of black or gray granules. Spotting them indicates your roof shingles have reached the end of their lifespan. Roofs can sustain damages as a result of using low-quality shingles by contractors during construction and weather changes as well. Windstorms, snow, and ice damage may cause nails holding your shingles to pop out, resulting in loose or missing shingles. They may tear or break off completely due to these factors. Consult professional services from a local roofing company to help reduce damages on your roof. Roof sagging can be noticed from the interior of your home. Original materials used may have weakened over time due to damages or deterioration after a certain period. Sagging may cause water to gather in certain areas of the roof. This may be noticed in the interior of your home by spotting and stains on your roof ceiling. Roofing materials may have been installed poorly or incorrectly, and this is a valid reason and concern to prompt you to make roof repairs. Consult professional services if you experience such issues in your homes roofing. Harsh weather conditions may affect your home’s roofing over time. Roofs begin to weaken and deteriorate over time. If you notice that material seems to fall easily and leave debris, these are signs that it is time to contact your local roofing company to help deal with your roofing problem immediately. It is important to know the age of your roof to access whether repairs should be done to avoid damages. Most roofs are designed to last 25 years. A house with standard shingles may start to disintegrate when they reach about 20 years. 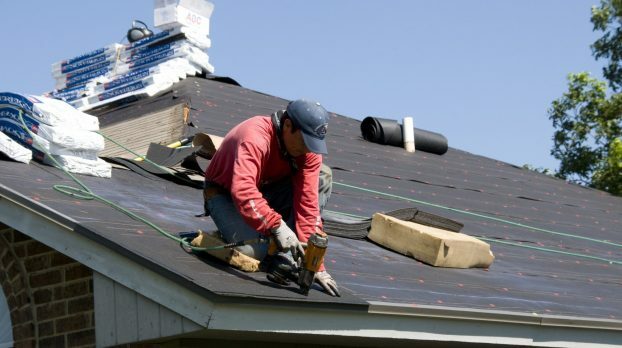 If your roof has been in place for almost this duration, it is wise to seek services of a local roofing company to avoid damages to your home. Take a look at the underside of your roof decking if you have access to the unfinished portions of your home attic. Water stains are a clear indication of a leaking roof. This means that water is running underneath your shingles resulting in roof damage. Call a professional roofing company if you notice any changes to your roof after certain weather conditions. Shingles that appear or rise above flat surfaces of your roof indicate damages from adverse weather changes. This may be due to a hail storm and excessive wind, thereby affecting your roof. High attic temperatures above 120 degrees may cause shingle blisters which are similar to hail damage. If you notice shingle pop on your roof, it is time to consult services of a professional roofing company to help you deal with your roofing problems.